Abu-Jaber’s father is from Jordan; his heritage Bedouin and Palestinian. His large, loud, exuberant family, many of whom lived in or near Syracuse, was a constant in Abu-Jaber’s life. At home and in her lunchbox, Abu-Jaber ate Middle Eastern food. This food and her Arabic name, so unlike her pale skin and murky green eyes, set her apart from her schoolmates. When Abu-Jaber was in grade school, her family moved to Jordan. In Jordan, it was her pale skin that set her apart. The smells and sounds and experiences of life in a crowded Middle Eastern city woke up senses Abu-Jaber hadn’t known in America. Just as her heart began to beat with the rhythm of Jordanian life, Abu-Jaber’s family moved back to America. 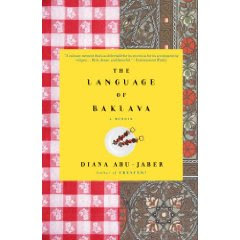 In her 2005 memoir, The Language of Baklava, Abu-Jaber describes her rootless journey to adulthood. She struggles to connect with her American and Jordanian cultures, often standing as an outsider to both. The essential truths and complexities of Abu-Jaber’s relationships to her family and twin cultures, as revealed through her stories, are captivatingly real. By book’s end, we understand Abu-Jaber’s American and Jordanian heritages are inseparably bound in her heart and soul. In telling her family’s stories, Abu-Jaber reveals universal truths about the immigrant experience in America. Like millions upon millions of immigrants who’ve given strength and diversity to their adopted homeland, Abu-Jaber’s family, many of whom are Arab and some of whom are Muslim, is inextricably woven into the fabric that makes up America. None of these immigrants, or their descendants, can be categorically ejected or rejected without leaving an irreparable hole. For me, Abu-Jaber’s book had special resonance. The Language of Baklava is, in many ways, a love letter to Abu-Jaber’s father. I began reading it in a nursing home, by the bedside of my ill father who, briefly and terrifyingly, didn’t recognize me. The veil of sadness through which I read The Language of Baklava made its message of paternal love particularly poignant. I returned home from visiting my father emotionally drained. That night, I cooked some of Abu-Jaber’s recipes for my husband. As we greedily piled our plates with Jordanian Kofta and garlicky Yogurt Sauce, I experienced anew the relationship between food and love that inspired The Language of Baklava.